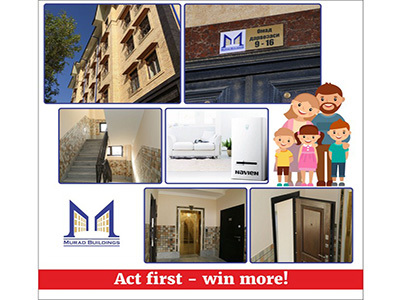 Murad Buildings | Promotions and discounts | The action for the first tenants of the residential complex Gulsaray! The action for the first tenants of the residential complex "Gulsaray"! The special offer for buyers of apartments in the first block of "Gulsaray" complex, located in Karakamysh 1/4! * Third trio will receive a 2% discount. wide street and easy ride. Available - 8 four-room (116 m2) and 8 two-bedroom (99 m2) apartments. For more information call 200-88-22. Go to the selection of apartments in the residential complex "Gulsaray". * Promotion is valid if paid within 10 days.